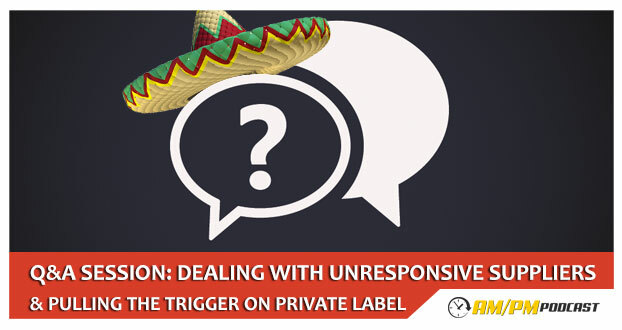 Unresponsive suppliers can be a pain to deal with, in this Q&A session we go over how to craft your emails for fast responses and we also cover the criteria Manny Coats uses to ‘pull the trigger’ on his private label products. MANNY: Let’s get to the first question. GUI: This one is from Paul and was recorded on ampmpodcast.com. Q1: I’ve been looking to find bunny-scratcher type of products for a while, I’ve been quite successful. My question is, what do I do about Alibaba? I’ve sent over 150 emails on 60 products that would fit in the bunny-scratcher approach where you fit 3 to 5 sales a day in a thinly contested market and I don’t get any responses. If I do get, it’s 3 to 5 weeks later. I don’t know if they think it’s going to be a low seller that they don’t put any eyeballs on it or don’t care… But it also seems that they’re unrealistic about their price. If you have any advice to share, please do. MANNY: Why would the companies on Alibaba not get back to you in a good time frame. The email address you have, like a Yahoo address, something that’s not your business shows that you’re not that serious. Get the right email address with your business domain. Another thing is if you don’t sound serious when you contact them. We had an email template on episode 8 that you can use for this purpose. It’s a serious and professional email. Another element is if you are signing your company and name/title at the end of your email. GUI: We are making a lot of assumptions but if they’re correct, it’s just the perception from the supplier’s point of view. MANNY: You’re talking about the bunny-scratcher market – those suppliers are limited. Since these products are so specialized, maybe there aren’t enough companies that supply this. Maybe the companies that show on Alibaba who at some time did manufacture these products, discontinued it so they just don’t respond to any emails related to that product. Let’s get to the second question. GUI: This one is from Jason. We answered a question for him on a previous podcast and he sent us a follow-up question. Q2: Let’s say you have the ultimate product. There’s not a lot of competition and the product ideas is 10 out of 10. What would be the minimum rating on a scale of 1 to 10 that someone can still pursue it as an initial product? My thoughts – 5 is something that has enough demand, there’s some competition but you think that you can get in there and sell some and make profit but you don’t know if you’re going to get to the 50% profit margin, so you don’t know if you’re going to hit 10 a day. On a scale from 1 to 10 (one being screaming running away and 10 being the golden goose), what level of a product would you encourage people to take an action on vs just keep looking for another option? MANNY: I always get scare with scales because they’re so different for everybody. GUI: Maybe he can’t find something that’s a perfect 10 to him so he wants to see how low he can go in that scale he has. Maybe a few parameters what you consider to be a goal would be better. MANNY: Let me use this parameters: one a scale from 1 to 10, when do you pull that trigger? Is there really a 10 for a product? If you dominate 100% of the market and nobody can compete with you because of patented products and there’s sufficient sales to meet the financial criteria that you’re looking for, that’s good. Everything else would be less. For the newbies – a “bunny-scratcher” is a product which there is very little demand for but there is also almost no competition – super niche, super weird. It’s easy money. It also means that I might go below the $10 profit level per unit that I’ve set for myself. Let’s say the bunny-scratcher makes me $8 profit per unit and I sell 5 units per day with virtually no competition – that’s $40 per day, $1200 in profit per month. I would go for that. You have to look at the whole picture. I would push such a product which generates 5 figures to a 9 and if it can generate 6 figures to a 10. I mentioned that it is important to get something that meets your financial criteria – for me, a product that generates $2000 in profit per month really isn’t a 10. Let’s think of an 18-year-old college kid that has just jumped into private label. He’s the one that came out with this bunny-scratcher, he’s making $2000 per month – to him it can be a 10. It might be the max amount of money that he can float. GUI: One of the things people do not consider is how much it costs to carry the inventory and in many cases the inventory literally floats when you order and ship your product by boat – you pay and wait for it. For that while you are not making any money so you have to carry that cost without making any money. It’s going to be a couple of weeks till Amazon pays you for that inventory, about 3-5 weeks that you’ll be without money and you have to have money to buy, especially the second order – it can be the most painful one because you have to pay for the inventory and wait, the first one is here and you have to order another one. MANNY: In order to order double the amount of inventory, you’ll be spending several dollars and you won’t get paid to order the inventory until all the units are sold and Amazon pays you. You then place your order with the supplier and they don’t just have the stuff on stock, it’s going to take 15-20 days until they finish your order and then your option is to order via ExpressAir to get it in 8 days. How much can you afford to make? You might find yourself in a position where the demand exceeds your financial ability. If you’re out of inventory for a month, you lose your ranking. MANNY: At what point do you pull the trigger? It’s relative to where you are in the business and your finances. GUI: Is there a number of reviews on any given product that would be a deal breaker? Is there a price point that you’ll never go under? That would help. MANNY: It all depends. If you’re going into a market where all the sales are dominated by one big seller and they’ve got 1000 reviews, I’d stay away from the market. If you have your top 10 sellers and there’s room for you, if the top seller has 1000 reviews and the bottom one 40, I’d consider getting into that. You don’t want to get into a market where everything is priced competitively and it looks like it’s a race to the bottom. You want to have a product that your private label version I different to everyone else, you don’t want to compete. Your product has more cool things that people will pay for it. It takes a few podcasts to find the right product. GUI: Go through episodes 5-10, it goes through the product selection process and coming up with ideas. Just get started, it’s the best way to learn. 03:10 – Manny’s first question to Gui. 03:59 – First Q&A question. 11:24 – Gui’s question to Manny. 13:43 – Second Q&A question.